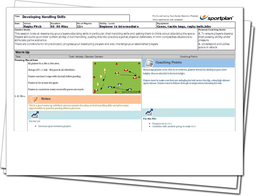 Improve your player's handling skills with this session plan, ensuring that they can consistently perform and pass accurately under pressure. Develop your players to think ahead of moving into space, working on their ball handling moves, and attacking with precision. Understand the game and gain the upper hand over the opposition! Start to work from the off on your player's passing, developing their current ability and improving any areas that needs to be worked on. Practice passing with a lack of pressure so your players are ready for the rest of the session fully refreshed! As you continue through the plan, make sure your players are executing the correct techniques when passing and receiving - one loose control can change a match! 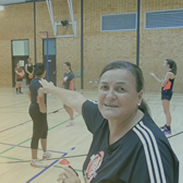 Bring in defenders the more your players are increasing their confidence, using drills to set up game situations, so your players can know what to expect in their next match. Finish off with a team match, bringing together all of the skills your players have learnt, as well as encouraging other areas to work on.